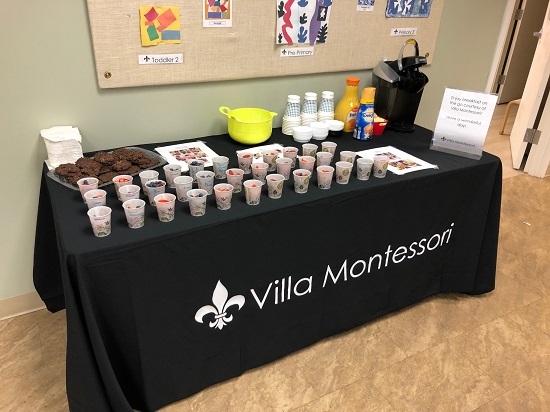 Columbus, Ohio based Villa Montessori Preschool Columbus is pleased to announce that they recently hosted a successful Parent Appreciation Breakfast on their premises. See more here: https://bit.ly/2RzSKd2. Held at the end of January, this event helped accomplish the nursery and childcare centre’s mission of supporting their children’s curiosity with innovative learning and joy. It also gave parents an opportunity to embrace some of the finer points of parenthood within their child’s learning environment. The children played an important role in the event: they assisted their teachers in putting together the meals for the Breakfast. Working side by side, they carefully selected, chopped, and portioned a variety of fruits and other snacks that made for a simple, yet delicious, breakfast for all their guests. While the event itself was as successful as everyone had hoped it would be, most of the love, learning, and love of learning, went into its preparation. Of course, both parents and children alike got to enjoy the fruit of those labours as well. Parents play a significant role in their children’s educational and emotional development, but it is also important to continually reassure the parents themselves that their child is making good progress in the best possible surroundings whenever possible. The Breakfast helped fulfil this by encouraging parents to explore the learning environment that was lovingly crafted for their children, showcasing both the preschool’s attention to passive guidance, as well as the valuable interpersonal lessons taught to their children in it. As proudly stated on the preschool’s website, “Our Montessori classrooms are simply and beautifully designed to inspire curiosity, promote hands-on learning experiences, and build self-confidence! After all, the preschool years set the foundation for a lifetime of learning. Our beautiful environments feature comfortable spaces to learn, collaborate, and grow.” Students at the preschool “are empowered to play and learn at their own pace, guided by their own interests.” The classroom itself is considered a ‘third teacher,’ subtly designed to let children independently explore the easily accessible materials and projects within it, and develop their own interests. This ethos extends to the Reggio-inspired playground, designed to encourage creative play. It also serves as an outdoor classroom for Art and Science, helping to add zest and variety to a child’s learning experience. Opened in 2016, the Villa Montessori Preschool Columbus at the google maps location https://goo.gl/maps/3KMW4ki6wop, welcomes all children between the ages of 12 months (infants) and six years old. With over a decade’s worth of experience integrating Montessori and Reggio, two of the most dynamic and inspiring curricula in the world, the preschool gives every child in its care a memorable and enduring foundation of learning that will benefit them for many years to come. Centrally located in Polaris, they welcome families from the surrounding areas in Columbus, Worthington, Westerville, Dublin, Delaware, Lewis Center, Galena, New Albany, Hilliard, Upper Arlington, Easton, Gahanna, and Canal Winchester. Parents who wish learn more about the preschool and its unique premises may attend an Open House event, or schedule a Private Tour if they prefer. Once parents attend either of these events, they may further schedule an Experience Day, free of charge, that allows their children to spend time directly experiencing the preschool’s educational merits. Those looking for more information regarding the admissions process, curricula, and more may contact Tamye Crutchfield of Villa Montessori Preschool Columbus. They may also visit the official website at https://polaris.villamontessoripreschool.com to learn more about the preschool, or get in touch through the included contact form. Alternatively, the Villa Montessori Preschool Columbus can also be reached through their social media platforms on Facebook, Twitter, and Instagram etc. Villa Montessori believes you should get everything you expect from childcare in a slightly less ordinary way. You’ll find our unconventional approach inspires children and parents alike. Come visit our Columbus, OH location to see for yourself.